The June expedition started normally enough. The team consisted of Jason, Amy, Jonathan, Marty, and myself. 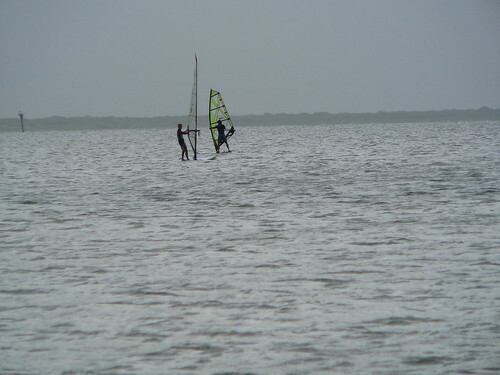 Amy, Jonathan, and Marty were first-time windsurfers. Welcome to the sport, guys. Jason and I are veterans, but only by our own very low standards. The ride down was mostly uneventful. Except perhaps for the mystery of the flying frog. Amy and Jason tried to sleep a bit to make up for the 3 hours of sleep they got. Apparently they drove to Dallas to see a concert on Friday. The first thing Jason said to me that morning was "You're going to be so mad at us." I guess because they forgot to invite me. We stopped for lunch on the island (I can't say where, we took a vow of secrecy) before cruising down to Worldwinds. The weather looked sad at this point, rainy and calm. But we're troopers, we don't just give up. Well, not today. After finishing lunch at Worldwinds, Amy and Jason passed out in the Jetta while the rest of us watched windsurfing videos and waited for the weather to clear up. There was talk of giving up for the day (mutiny! ), but we held things together until Don and Olivier gave the green light. Jonathan and Marty started their beginner lesson -- their first hit. I rented a F2 Stoke 155 and a 5.3 meter sail. Each of us donned attractive wetsuit tops to dull the cool wind. Amy and Jason continued to recover from their concert the night before. Jason claimed that he would only sleep for a little bit longer, but I didn't believe him. After an hour or two, Jason surprised me and joined us on the water. Now I know to believe. The man is made of stern stuff. Amy opted to read her book and hope for more inviting weather Sunday. She also kindly shot photos of us on the water. Hours past. I think Jonathan gets voted king beginner windsurfer of the universe. He managed to return to Worldwinds without walking. He tacked all the way back, just like a champion. We checked into our hotels and started the process of desalinization. Jason somehow got the shower slot before mine and spent 3 hours in there. He eventually popped out, announcing proudly that he had shaved his chest. This became the fallback joke of the trip. When in doubt just chide Jason. For dinner, we hit the Waterstreet Seafood Co. Actually, first we went to the Waterstreet Oyster Bar. We decided there that the line was too long, so we got reservations at the Seafood Company. We then suffered the delusion that the Oyster Bar was cheaper. Cheaper means better, so Jonathan left to get reservations there. While he was away we had a debate about the relative cheapness of the two restaurants. Careful weighing of the evidence let us conclude that the prices were identical just as Jonathan emerged with an Oyster reservation. We immediately applied our new knowledge and sent Jonathan back to cancel the reservation. Our confusion worked out perfectly. Jonathan walked out of the Oyster Bar and lo! the Seafood Co. beeper beckons us to our table. We successfully distracted ourselves from our gnawing hunger. Teamwork! After dinner, we drank beer and listened to some music on the Executive Surf Club patio. We then migrated to Cassidy's Irish pub to end the night with a round of tasty beverages and traditional Irish music. Planning for trips to Corpus has become more and more difficult as the number of interested folks has increased. To help me help you not be sad, please let me know of any bad July dates by commenting below. If you give me dates in person, by phone, by email, by IM, by fax, or by carrier pigeon, I will promptly forget them. On purpose. Of course, I can't promise to please everyone with the dates I pick. Sorry about that. Even if desires don't conflict, hotel and Worldwinds availability might. Still, you face far better chances of getting to windsurf if you give me your details in the comments for this post. So, what are you going to do right now? That's right, you're going to look at your calendar for July. Then you will leave a comment on this post. This comment will contain any dates that would conflict with a trip to Corpus Christi. Thanks! Our next monthly trip to Corpus Christi has been scheduled for June 23-25. I think this will be trip #6. We'll surf by day and enjoy Downtown Corpus by Night. 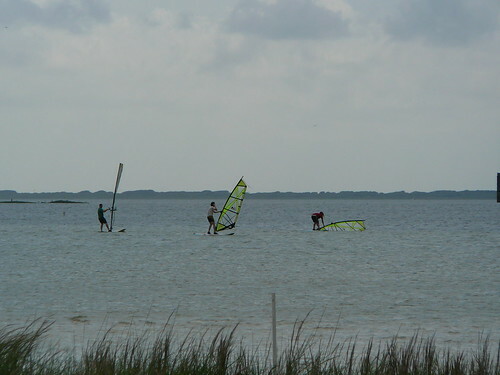 Except for the windsurfing, everything is within walking distance of the hotel downtown. You can see the photos and posts from a past trip here, here, here, here. For lodging, I'm staying at the Best Western (Best Western Marina Grand Hotel). This hotel is downtown, right next to a marina on the bay. You can find more info on it elsewhere on the blog. Check-in time is 3pm, checkout time is noon. Make reservations at the Best Western Marina Grand hotel or arrange to share a room with someone who did. Check in on 23 June, checkout 25 June. When I checked, the AAA rate was the best deal. You are responsible for your own hotel reservation. Call Worldwinds at 1-800-793-7471 and schedule your classes, or reserve a board rental if you don't want to take a class. Tell them that you're with John Knox's group. Please note that Beginner classes are quite full on the 23rd. There are beginner classes open on the 24th however, if you're willing to just rent a Kayak or otherwise amuse yourself on the 23rd. You'll want to take the beginner class on Sunday (as noted above, you probably can't get a class on Saturday). You can ask Jay, Jason, Matt, Karen, Freddy, or anyone else -- it isn't hard, and it's lots of fun. The beginners class will probably start at 11:30 am. On Monday, you might want to try the intermediate class if there are openings. I suggest at least giving it a shot, but it's up to you. The difficulty level increases a little, but it just means falling off the board a bit more often. Falling is half the fun. I strongly suggest taking a class ASAP even if it is just to get a refresher. With a month between each surfing session, a refresher can mean the difference between struggling all weekend and moving on to the next level. We should be surfing at Worldwinds by 11. Worldwinds closes at 6pm, so we should all be checked in at the hotel by 7pm or so. We'll desalinate and aim to grab dinner downtown at around 8pm. I'm thinking that I'd like to try the Waterstreet Oyster Bar. Sunday, maybe we can get breakfast at La Bahia. 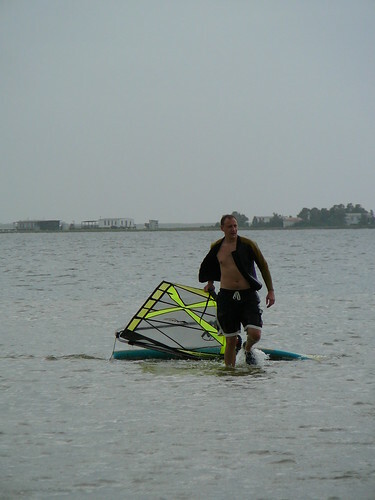 After, Windsurfing class or practice for as long as we can take it. We'll play it by ear for dinner.